Any day that includes a bubbling cauldron of cheese fondue cannot be bad. Especially when that fondue is sized for 10 but split only betwixt yourself + someone you like enough not to mind when he double dips, comes with an enormous loaf of crusty sourdough bread, and is prepared by a restaurant that looks like an adorable Swiss chalet. Yep, this day was perfect. On Sunday, Ben and I took a little road trip to New Glarus, the “Little Switzerland” of the United States—or at least of south-central Wisconsin. The day was so gorgeous and idyllically fall-esque that I would have written a sonnet about it, were I the sonnet-writing sort. The catalyst that prompted our drive: beer. In addition to being a quaint, Swiss-inspired village, New Glarus is also the home of my favorite brewery, the logically named New Glarus Brewing Company. A small independently owned craft brewery, New Glarus has gained a national name but distributes only in Wisconsin (yet another reason to come visit folks). Popular brews include Spotted Cow, Fat Squirrel (my personal favorite, both for name and for taste), Moon Man, and intriguingly named Totally Naked. Naturally, we had to stop for a bag of fresh cheese curds. The brewery tour + beer tasting were fantastic, the fondue was liquid heaven, and the pork schnitzel sandwiches we ordered in addition to the fondue might have been overkill. Did I mention we ate cheese curds a mere 120 minutes in advance of said fondue? And that the fondue was sized for a baseball team? And that we had polished off half a pan of banana breadthat morning?We had hit that sweet point of eating no return. Once you’ve gone over the deep end, why not keep diving (or in our case dipping)? Neither Ben nor I are at risk for low bone density, that I can guarantee. For Sunday dinner following our afternoon of delightful excess, I cancelled my plans to make a comfort-food casserole, and we had baked turkey tomato omelets with only a tiny amount of cheddar—at 10 p.m. after our tummies had semi-recovered. Sunday night, I made my weekly pledge to detox from weekend excesses by choosing healthy foods in the coming days. My first selection: CHIPS. Yes, chips can be a detox food, and no, I’m not making wild political promises. Rather, I’m offering a yummy recipe for addictive chips you can eat to excess any day of the week. Meet super food KALE CHIPS. This KALE CHIPS recipe creates a crispy, healthy oven wonder. Packed with beta carotene, vitamin K, vitamin C, antioxidants, and even calcium, kale is an excellent addition to your diet. It also makes one mean munchie. (If fries are more your junk food style—or if like Ben and me you love ‘em both—this post is for you). 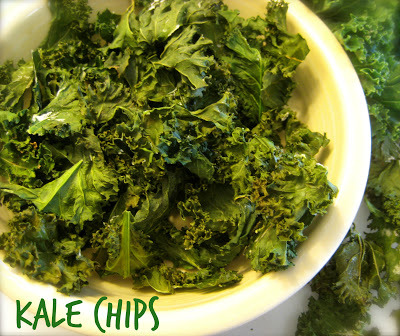 ThisKALE CHIPS recipe is so tasty, Ben and I are both addicted. As in, we polish off the entire bunch in one go. Ben is even REQUESTING that I make these, which does not happen frequently where veggies are involved. Hope you enjoy these crunchy little morsels. Go ahead–clean the pan! Kale Chips Recipe: Why settle a skimpy detox beverage when you can gobble a whole bowl of these beauties? This KALE CHIPS recipe is a child of experimentation (and disaster). I’ve burned batches, over salted batches, and really over salted batches. The below I believe to be Goldilocks approved: They are jusstttt right. Yes, chips can be a detox food. I’m offering a yummy recipe for addictive chips you can eat to excess any day of the week. Meet super food KALE CHIPS. Rinse and dry the kale, then remove leaves from stems. Tear into large pieces, place in a large bowl, and coat lightly with cooking spray (or drizzle with olive oil). Toss leaves gently so that they are evenly covered. Sprinkle with salt and toss again to coat. Spread leaves in a single layer on a large baking sheet (I needed two). Bake for 20 minutes, or until crisp. If using two cooking sheets, rotate positions half way through. Cool on baking sheet and munch away. Kale chips always feel like such a treat – it’s hard to believe they’re the ultimate healthy treat! Couldn’t agree more!! Gotta live a healthy food that tastes too good to be good for you. Thanks so much for your comment! What a seriously fun day!!! Totally a day my husband would LOVE! With the exception of the Kale Chips. You read about my daughter and her “green aversion”, my husband is about the same. She came home from her dance class the other day and her teacher had brought Kale Chips for them to try. She LOVED them! We made our own, and while they weren’t as good as the teacher’s, they were pretty darn good. Except my husband didn’t think so. I’ll spare you his Academy Award winning acting, but we all laughed pretty darn hard. I’m going to give your recipe a try and see if they are closer to what the teacher made. Thanks! And thanks for the lovely comments as well! I hope this recipe does the trick for you and your fam. Let me know how it turns out! Oh, cheese curds are ALL OVER this blog, lol.My family thinks I’m nuts, but that’s because they’ve never tasted one. Those who haven’t tried them just can’t appreciate the magic, but I know you do!! We LOVE baked kale chips!!! My hubs looked at me like I was nuts when I pulled them out of the oven–but he was asking for more when we finished them! just made these! so crispy and an easy way to down veggies in an easier form ;). I might try with Lowry’s Seasoning Salt? Cheers to making veggies totally snackable! If you really enjoy the flavor of Lowry’s you can definitely try it (be careful to just use a little–that stuff is potent), but I’d probably go for a pinch of red pepper flakes or a dash of smoked paprika if you are looking for an extra kick. If you try it, I’d love to hear what you think!